The ACT and the SAT, overseers of the nation’s two rival collage admission tests. First, the College Board released a set of charts that showed how new SAT scores compare with the old SAT scores and ACT scores. It turns out that the new SAT scores are somewhat higher on the 1600-point scale than comparable results from the old version of the test. A new SAT 1300, for instance, corresponds to a 1230 on the sections of math and critical reading in the old version of the test. The College Board, which owns the SAT and is based in New York, also asserted that a new SAT 1300 corresponds to 27 out of a maximum 36 on the ACT. In general, students, parents and schools trust the ACT and the College Board to get the technicalities right. Here the College Board had failed to do that. Some situation about this exchange: The ACT, launched in 1959, had for periods smaller market share than the SAT, which debuted in 1926. The ACT has long billed itself as a success test in four sections: English, reading, math and science, plus an optional essay. 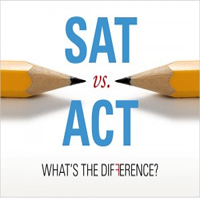 In 2012, the ACT overtook the SAT and became the nation’s most widely used test. Both the College Board and the ACT are competing intensely for state contracts to deliver testing services in public schools.